As visual creatures, everyone can appreciate photography and art. With the progress of internet as well as smartphone cameras, everyone can be their own artist or photographer. Custom photo magnets can change a bare metal walls, filing cabinets, and car or refrigerator doors in your very own art gallery. For businesses, this can be a great opportunity to showcase your products and services. Personalize your own photo magnets with NextDayFlyers. Perfect as gifts, holiday giveaways, or promotional freebies, our photo magnets are made with top quality full color printing. Our photo magnets are available in a variety of sizes. Upload your photos and use our Online Design Tool to create one from scratch. Everyone likes to get a little giveaway from a happy event. A remembrance like a photo magnet can give a personal touch to your guests. Showcase your products and services with a photo magnet. You can use creative photo designs along with your contact information to keep your business in your customers' minds. 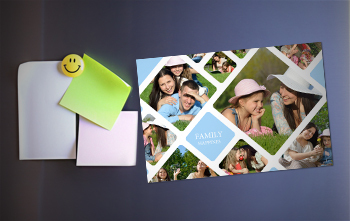 Design your photo magnets with grids or lists that your customers can use like a to-do list or calendar scheduler. They will definitely put your photo magnet on the refrigerator door.